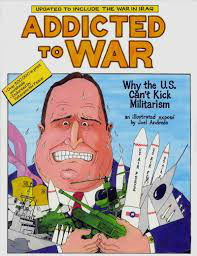 'Addicted to War' a graphic book revealed that the US has been an Imperialist and colonialist malevolent power since its inception. Manifest Destiny and an insatiable appetite for commercial opportunity drove every action and still does. The book is dripping with facts, quotations and history that I was unaware of. Though published in 2002, the reality and totality of malign US militarism is wonderfully described and the message remains the same today. The US is driven by the self interest and narcism of the politicos and military industrial complex controlling it. Hundred of millions world wide and in the US have died, starved, been maimed and continue to suffer as a result. The facts and sources are well researched and detailed in the back of the book. The US is The Evil Empire.